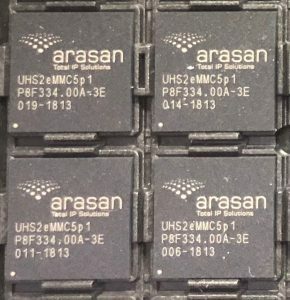 This is a production ready stack for Arasan’s eMMC Host Controller IP that is used to connect to SD, SDIO, or eMMC devices. 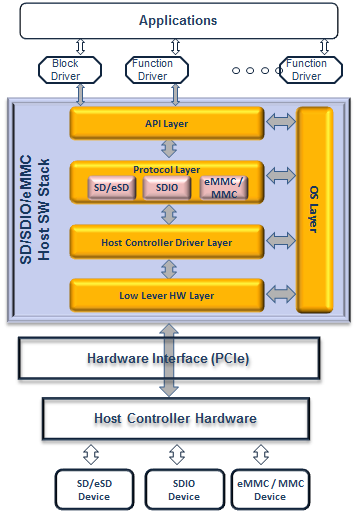 The SD4/SDIO4/eMMC 4.5.1 Stack can also be used for validating a device during its development and integration life cycles thereby helping designers to reduce the time to market for their product. The modular neX+ stack is architected to be OS and platform independent which eases porting effort. It has a thin OS and hardware abstraction layer making it highly portable. The neX+ stack provides a generic API set to access, control and configure the bus driver, host controller driver and the underlying hardware. The SD4/eMMC 4.5.1 stack includes functions for initialization, sending of commands, data transfer, power management, SDIO interrupt handling, bus configuration, client driver matching, host controller hardware configuration and shutdown. The neX+ stack can support a single host controller with multiple slots or multiple host controllers with multiple slots.